lol! Hilarious. 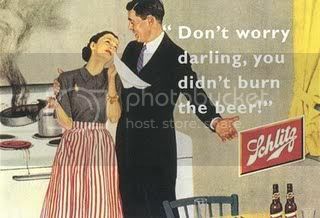 My uncle used to drink Schlitz!! LOL... This was priceles. Thank you for sharing! Talk about a walk down memory lane. Why do you think feminism as a movement came into being? Clunk him over the head with the Schlitz. That's what I say. Yeah, I DO remember that brand and their commercials on TV. :) You're Welcome, Guilie! Thanks for stopping by and have a fantastic weekend!